Kayhan Kalhor — Laguna Beach Live! Kayhan Kalhor, arguably the best-known artist working the Persian classical tradition in the United States and director of Masters of Persian Music ensemble. 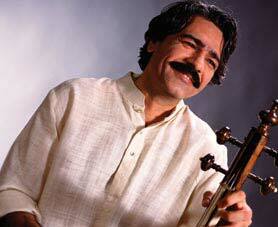 Kayhan Kalhor is an internationally acclaimed virtuoso on the kamancheh (Persian spiked fiddle). His performances of Persian music and his many collaborations have attracted audiences around the globe. Born in Tehran, Iran, he began his musical studies at the age of seven. At thirteen, he was invited to work with the National Orchestra of Radio and Television of Iran, where he performed for five years. When he was seventeen he began working with the Shayda Ensemble of the Chavosh Cultural Center, the most prestigious arts organization in Iran at the time. He has traveled extensively throughout Iran, studying the music of its many regions, in particular those of Khorason and Kordestan. Kayhan has toured the world as a soloist with various ensembles and orchestras including the New York Philharmonic and the Orchestre National de Lyon. He is co-founder of the renowned ensembles Dastan, Ghazal: Persian & Indian Improvisations and Masters of Persian Music.Kayhan has composed works for Iran’s most renowned vocalists Mohammad Reza Shajarian and Shahram Nazeri and has also performed and recorded with Iran’s greatest instrumentalists. Kayhan has composed music for television and film and was most recently featured on the soundtrack of Francis Ford Copolla’s Youth Without Youth in a score that he collaborated on with Osvaldo Golijov. In 2004, Kayhan was invited by American composer John Adams to give a solo recital at Carnegie Hall as part of his Perspectives Series and in the same year he appeared on a double bill at Lincoln Center’s Mostly Mozart Festival, sharing the program with the Festival Orchestra performing the Mozart Requiem. Kayhan is an original member of Yo-Yo Ma’s Silk Road Project and his compositions Blue as the Turquoise Night of Neyshabur, Silent City and Mountains Are Far Away, appear on all three of the Ensemble’s albums. His most recent commission for the Kölner Philharmonic in Germany will be premiered in October 2009.